Winter came early to South Texas this year, in fact the year 2000 had many surprises as far as weather is concerned. Weather extremes started back in late summer when we had record breaking highs. Temperatures went to the century mark in the Coastal Bend for one week in September Weather Extremes for September and we also experienced extremely cool temperatures in October Weather Extremes for October making fall feel colder than it did all last winter (1999 - 2000). December is the month when cold temperature really set in, many nights temperature hovered just above the freezing mark and day time temperatures just barley made it into the fifties. Although as the rest of the country was shivering in the cold and freezing temperatures we were spared the worst with only two day below freezing 32°F (0°C) and 28°F (-2°C) both being of 5 hours or less in duration and as luck would have it, no frost. January would be a different story though and on Wednesday. January 3rd., temperatures dropped to freezing just after midnight, in most areas of the Texas Riviera and a heavy frost would follow into the early morning hours. It is now January 18, 2001, temperature is 45°F (7°C) @ 7:48am. Predicted temperatures for this weekend are 29-31°F (-1.5°C/-0.5°C) with heavy frost. 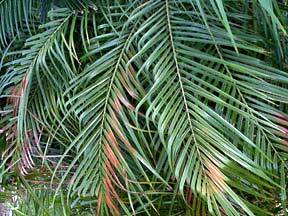 The Dypsis decaryi, as it was the only palm I protected, shows signs of browning leaf tips. Some spotting of leaves are found on the Adonidia merrillii, slight bronzing of exposed Phoenix roebelenii leaves and 80% damage to Hyophorbe lagenicaulis. 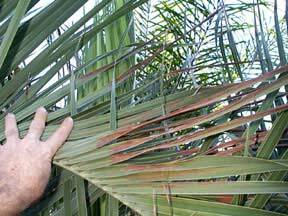 All other palms are OK with perhaps some minor leaf damage, these include, Wodyetia bifurcata, Caryota mitis, Ravenea rivularis, Roystonea elata, Syagrus romanzoffiana, Thrinax parviflora, all Chamaedorea sp., Rhapis excelsa (all) and other hardy palms as well. With about 1 inch (2.5cm) of rain thus far this year, the ground is well saturated and freezing temperatures are predicted for tonight January 19-20. January 20, 2001, no freeze but temperatures dipped to 34°F (2.5°C). 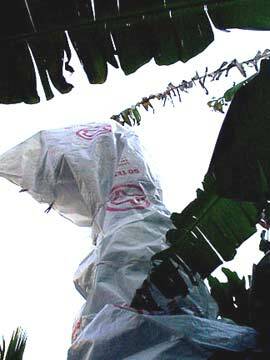 I did take some pictures of damage to papaya (frost damage from January 3rd), Banana (winter cold damage only) and Dypsis decaryi showing the frost protection I used). January 21, 2001, temperatures high 66°F (18.5°C) lows 37°F (3°C) a very mild day after a cool start. All of next week should be mild with day time temperatures in the mid 60's (18°C) and lows in the mid to upper 50's (10°C). Still temperatures are about 5 degrees below normal for this time of year. January 26, 2001 Temperatures 77°F (25°C) and 65°F (18°C) over cast skies with rain or thunder storms in the forecast for the 27th. 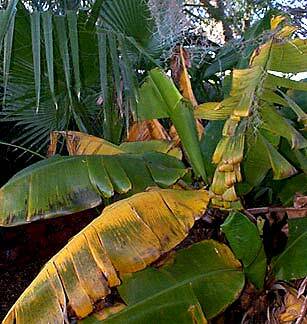 Despite being protected from frost this Dypsis dercaryi shows some cold damage to the leaves. Notice new leaf opening in center. January 31, 2001: As this month comes to a close, we begin our slow warm up and the march towards spring. The winter damage report is not all that bad. 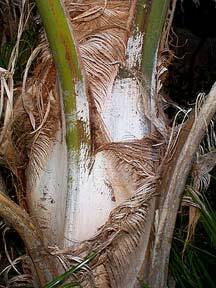 The Adonidia merrillii (Christmas Palm) is starting to show more and more winter cold damage, but it should recover just fine as it has done so in the past. 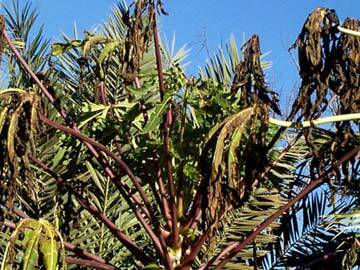 My biggest disappointment is the Dypsis dercaryi (Triangle Palm). I tried to protect it from the frost but the cold must of been too much as the leaf tips are turning brown. although not dead but still disappointing. Although we're not out of the woods yet, as February can being some cold night with frost, the days however are getting longer and warmer, barring no more heavy frost I'd say, winter is just about through. Todays high temperature, 68°F (20°C) with lows about 53°F (11°C). Yesterdays high was 78°F (25°C) making it the warmest day in January. February 1. 2001: low 51°F (10°C), High 58°F (14°C), with rain in the forecast. February 2, 2001: low 48°F (8°C), High 55°F (13°C), and rain. Wodyetia bifurcata (Foxtail Palm), no damage, Ravenea rivularis (Majesty Palm), slight leaf burn and Caryota mitis (Fishtail Palm), no damage. February 3rd and 4th Highs 70°F and 40°F for the lows. More to come later with pictures, lets all hope for an early SPRING! Aspergillus seed germanation test and planting and soil amendments.